Here's a lovely way to use up any leftover chapati dough you have lying around over the weekend. This was a totally spur-of-the moment dish. It was Saturday morning, I had chapatis, and I had eggs. It took just a quick moment to put it all together. This doesn't even require a recipe. I simply heated up about a teaspoon of grapeseed oil over medium heat in a small non-stick skillet, then added about a half teaspoon total of black mustard and cumin seeds. As soon as the mustard seeds started popping I stirred in a heaping teaspoon of sweet curry powder. 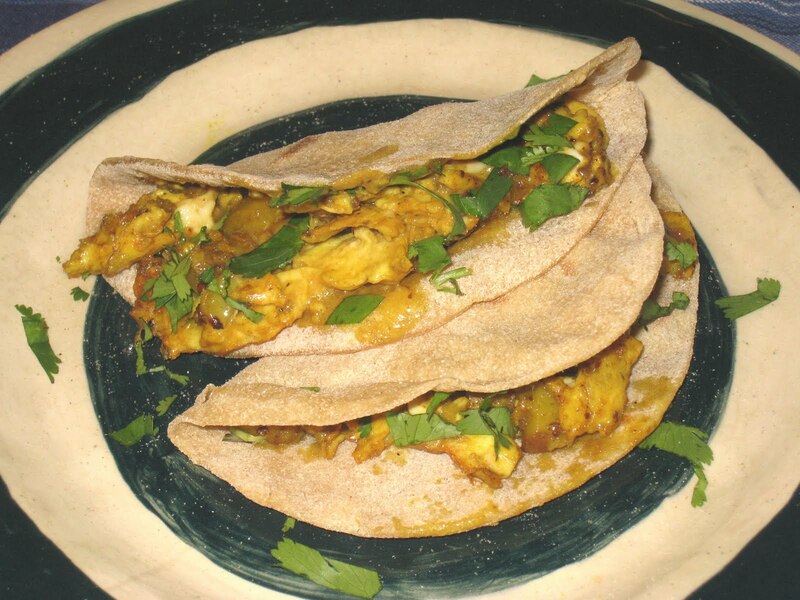 After stirring for about thirty seconds I poured in 2 well-beaten eggs (seasoned with salt and pepper, of course), scrambled them (keeping them on the soft side - that's how I like them), and stuffed the mixture into the chapatis. Cilantro would have been the perfect garnish/accompaniment, but parsley was what I had so parsley was what I used. It worked. This was good enough that it would be worth making the chapatis specifically for the purpose. I plan to do just that the next time I need a quick, tasty breakfast. And they travel well if you need to take them on the go.